junk rig, but which one?? One of the biggest challenges in doing a junk rig conversion, for me, was the very beginning: deciding which design/sailplan to follow. Reading up, there are a number of choices, and then once a particular design is selected, there are more choices, including sailcloth, batten material and method of attachment, and specifics of overall rigging, as well as the question of camber, which is the curved shape that can be built into a sail, to help with going upwind. My process of resolving those questions went on for years, literally. Now that the selections have been made it’s quite a relief, and it seems time to share what I’ve learned about the deciding factors. For a while I thought, oh I’ll just copy what Dave and Anke (at triloboats.com) have on their current boat… until it turned out that I would need something close to a 30 foot mast. Oh well! Then it looked like the Reddish rig, with its traditional character and proven, low-tech possibilities, could be a good fit. For a while there was a detour, and I was intrigued with the split junk rig, designed by Slieve McGalliard – who also did that nice article about yuloh design. I’m still intrigued, but the mainmast on AUKLET is too far forward for that one. Along the way it was pointed out to me (thank you Dave) that the most sail area for the shortest mast would come from the Reddish rig, and making low mast height a priority, in the end I came back and settled on that one. Things are always so much clearer after the fact, and I now realize that the straightest line through junk rig decision-making (at least for me) is indeed the mast question. Mast height rules out some junk rig designs and enables others, and mast position does the same. Some people change the location of the mast on their boat, but I didn’t want to get into that. With AUKLET, having the mizzen mast provided some room for adjustment as far as location of sail area, so except for considerations with the split junk rig, mast height was really the deciding factor for the overall design. Now here we are, with a Reddish rig in progress. Then there is the question of size, once the shape of the sails has been decided. Determining sail size is related to mast height, desire for sail area (and what the hull can carry), and locations of booms and sheets, as well as the relationship of the forces on the sails to the forces on the hull. Some tinkering goes into figuring this all out. In the design process, it’s important to keep the combined center of effort – the “balancing point” where the wind pushes, for both sails – in roughly the same place as for the original rig. Sorting that out for this project involved starting with a scale drawing of the hull and masts, and then making cardboard cutouts, to scale, of potential sails. (It’s probably important that the cardboard is something like what comes inside shirts, and is not corrugated, so there’s no question of uneven weight distribution within layers.) 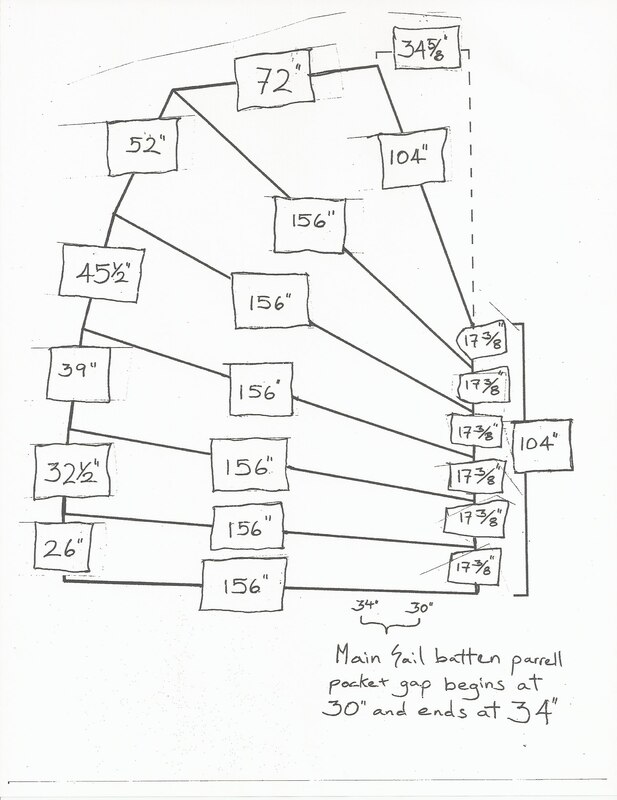 Balancing the cardboard cutout on a pin serves to roughly locate the center of effort for each sail. Then the combined center of effort can be determined by first working out the square footage of each sail (counting squares inside a scale drawing on graph paper helps with figuring this without using big geometry skills.) Next comes drawing a line between the two centers of effort, and measuring along that line proportionally, related to the ratio of the areas of the two sails; this yields the location of the combined center of effort. We had the original combined center of effort for AUKLET from the plans for the Glasshouse Chebacco, but you could find this from a scale drawing of the original sails, if you needed to, by making another set of cardboard cutouts from the original sail design. We actually did this for the Peep Hen a few years ago, though never took it further than the cardboard stage. However you get it, it’s handy to have the originally designed center of effort so that you can make the center of effort for the new sails line up with the original. In the end, for the AUKLET junk rig design, Theo and I made an entire array of sizes of cardboard cutout sails, to try out the different possibilities both by eye and for calculated balance. It was pretty entertaining – it felt like being a kid with paper dolls cut out from the Sunday newspaper, but way more fun! Because of the yawl rig, when the potential mainsail pulled the combined center of effort too far forward it was possible to increase the size of the mizzen to compensate. We had everything from a 10 foot boom on the mainsail up to a 14 foot boom, and eventually settled on 13 feet, and a 6 foot boom for the mizzen. (Boom length determines measurements for the rest of the sail.) The sail area for this final arrangement is 175 square feet for the main, and 37 square feet for the mizzen. This is more than the original design, which was 149 and 27 square feet, respectively. Phil Bolger, designer of this boat, used to write about that nobody just sails nowadays, so it’s more appropriate to design sail area for those who motor in light winds, and the Glasshouse Chebacco rig reflects this approach. Myself being a bit of a throwback, as far as the motor question, increasing the sail area has seemed appropriate to the actual use of the boat. Still, I’ve gone back and forth on the sail area question, and my thinking is continuing to develop, and to change back and forth, on this subject (see writings by Sven Yrvind for reasons for smaller sails). While I was swung toward the “wishing for more sail area” side of things, the time for an actual decision arrived, and now we have a really big sail! Necessitating a mast the height of the original Chebacco design, at 19 feet. These last two years I’ve been sailing with the borrowed short mainmast, which is 16 feet. I like that a lot, especially for things like squeaking underneath closed drawbridges, and the relative ease of stepping and unstepping the mast. Now that the junk sails are built, and the new taller mast is coming soon, I’m committed, but my thoughts keep going back to the benefits of a short mast and smaller sail. It’s a little late for a change, at this stage! It’ll be fascinating to see how the increased sail area feels – worth the compromise of height, weight and bulk? For extra headway in tiny wind? And just how much extra headway? I have no great need for speed, but reliable movement along the shore when the wind is minimal may turn out to be worth the trade-offs. Regardless of the issue of mast height for the new sail, something had to be done about the overall mainmast situation. The one that I borrowed from the Peep Hen (a much smaller boat) is tapered aluminum, 3 inches in diameter at the base, with 1/4 inch wall thickness. It’s had a good deal of strain and flexing, over these last two years, and there are issues about work-hardening, with aluminum masts, that can lead to breaking. It’s possible that everything is fine, but I haven’t felt confident. As near as I can tell from material on the Junk Rig Association site, appropriate, somewhat conservative scantlings for an unstayed aluminum mast for this situation are 4 inch diameter and 1/4 inch wall thickness in the lower part of the mast, with the diameter tapering higher up. The best I’ve been able to come up with is an aluminum flagpole that is 4 inches in diameter with 3/16 inch wall thickness, tapering above 11 feet to about 2 inches in diameter at the top. Five inches in diameter at the base would be considerably stronger, but won’t fit in the existing partners, and they would be complicated to change. As it is, I think that the 4 inch version will certainly be fine in the early part of its life; if I really love the rig, there is probably another mast change somewhere in the future. Other big decisions have been sailcloth, and the camber issue. Both of these questions completely stopped my process for a long time also. I originally wanted to go with acrylic sailcloth, such as Sunbrella. This would mean expecting stretch, and because of that, the sail would more closely resemble traditional junk sails in Asia, but would still avoid the mildew issues of cotton. This approach would have been taking a chance, but I rather liked the idea of the adventure. Then Suzanne, with a good practical eye for details of a question, looked at my sample of acrylic fabric and asked “how heavy is that going to be when it’s soaking wet?” That moment was the somewhat sad end of the acrylic idea, but I’m really glad that the question came up before I had a giant, soaking wet sail on my hands, too heavy to move. Maybe not a problem at first, when the fabric still had all its water shedding treatments intact, but surely as time went on. The other thing that happened about sails is that I came upon a sailmaker with some experience with building “Western” junk sails, on this side of the Atlantic! This would be Stuart Hopkins, at Dabbler Sails. (You can see his work at http://www.dabblersails.com .) Commiserating together on the question of fabric, and on the question of camber, we settled on Dacron sailcloth, and a very small amount of camber in the lower four panels of each sail (stated for the record, Stuart heartily advocated for more camber – if this flatter design doesn’t work out so well, it’s entirely my responsibility!) Above the lower four panels, the top two panels are left completely flat, for heavy weather. It’s an experiment, all the way around, and we’ll see how it goes. The argument for camber has to do with upwind sailing ability, which has generally been not so good for Western versions of junk rigs with flat sails. I’m intrigued by the theory that “fanned” sails, such as the Reddish rig, also develop camber as they twist. One can opt for an assortment of control lines, following traditional Asian practice, to make adjustments for optimal performance. That does assume that you know what you’re doing… Or are willing to take quite a while to begin to figure it out. But it does seem possible, and I’m looking forward to trying. Along the way in the planning/design process, I’ve also given up on the idea of bamboo battens, going with the highly recommended aluminum tubing version, in pockets. There is a source of construction-quality (as opposed to garden quality) bamboo in eastern Massachusetts, and I was hopeful for a while. But it turns out that, issue #1, there’s a lot of finish work involved in bamboo battens – wooden plugs for the ends, and varnish, and then, the consideration that really sealed it, issue #2: that the traditional way to make bamboo battens work out well (preventing splitting) is to soak them in seawater for three weeks before beginning the finishing process. (Thank you Lesley, at http://www.huntingjunks.org) Here we are in Holyoke, about 80 miles from the nearest seawater. It could’ve been done, but overall there is the question of exactly WHEN we would like this project to get on the water… So aluminum battens it is, and they are in fact almost complete at this writing. Beyond the design question, there’s the concrete progress. Presently, the sails are complete, and here; yards have been built, epoxied, and painted; the battens are cut to length, and wooden end plugs (turned, grooved, epoxied, and painted) are ready to be caulked in; a belaying pin collar and belaying pins have been made for the mizzen mast, as a place to fasten the zillion lines for the mizzen sail; and mast hardware, loads of line, and assorted other necessary bits, are accumulating in corners. On it goes!